The 2019 Monterey 305SS (Super Sport) is over the top with amenities and makes great use of new Mercury V8 outboard power. The latest trend toward using outboard power is as much a shift in propulsion systems as it is new paradigm for boat design. By hanging the motors off the very tail end of a boat, designers are freed up to create the kinds of interiors they want to rather than one that also serves to conceal an inboard propulsion system. Monterey’s latest contribution to that design trend and the newest addition to its outboard-powered lineup is the 2019 305SS, a 29-footer that is one of the first boats on the market to employ Mercury’s new V8 outboard engines. Displacing 4.6 liters apiece, the new Mercury V-8 outboards are rated from 200 to 300 horsepower depending on the application. The model that debuted at the Fort Lauderdale International Boat Show was fitted with twin 250s. Very cool, because they much quieter and more civilized than a 500-horsepower single engine would be. 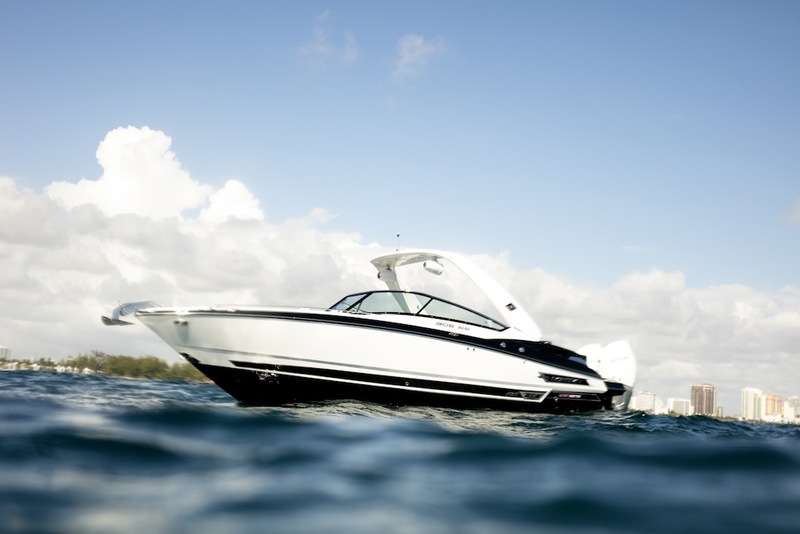 The 305SS offers endless possibilities for watersports action and cruising. Step on board from the swim platform, you can see that Monterey included a huge sun pad, with a backrest that folds up so you can have an aft-facing bench. The aft bench seat back also flips up to create a headrest for the sun pad, which lifts on gas struts to reveal a cavernous stowage compartment, a nice touch. Inside those nice touches continue. Monterey designers tucked a built-in cooler under the armrest on the starboard side jump seat. and a slide-out trash can beneath the cooler. To port, you can create another jump seat by pulling out a filler cushion, or leave it in place. The passenger seat features a flip-up thigh bolster and a backrest that converts to face aft. Just ahead of the passenger seat is a head compartment with a skylight and a sink. The simple detail of the skylight is notable because it lets light into what is usually a dark compartment without spoiling the sleek profile of the boat with a porthole on one side. The port-side cowl also is fitted with a folding door that aligns with the windshield walk-through to block wind on chilly evenings. The helm is like no other, with analog tachometers flanking the digital Mercury Marine VesselView screen. Those gauges are framed by a polished bezel, with a Raymarine navigation screen below and digital accessory switches to either side of the leather-wrapped tilt wheel. Monterey designers wrapped the whole dash with intricate French-stitched vinyl in a contrasting color thread. The helm seat comes with a flip-up thigh bolster and fold-down armrests. It also slides fore and aft. Roomy and luxurious, not to mention, easy on the eyes...we like what we see so far from this 2019 Monterey. Up front, the bow area has two forward-facing lounges with fold-down armrests in the center and armrests built into the coaming upholstery. The seats are set deep for an extra measure of security. The boat is so new, there isn’t much available in terms of photography, but Monterey fans will want to get a look at the 305SS at this season’s boat shows. It’s well thought-out, and as roomy and luxurious as you’d expect and it takes full advantage of the twin-outboard propulsion.